When did you last dine at a top-five fine dining restaurant in Torrevieja? There are many different styles of fine dining. As we described in a recent article, the best fine dining experience in Torrevieja is usually American. But, whatever the style of service, fine dining at its best has some common characteristics – the table will be pre-laid, and you should expect unobtrusive and attentive service. As you walk into a fine dining restaurant, you’ll notice that the tables are pre-laid. Pristine table cloths, sparkling silverware, linen serviettes, and glasses that glisten. Tableware will be adjusted according to your order; for example, your main course knife will be replaced by a steak knife if you order a sirloin, or a fish knife if you order sea bass. Glasses will be taken away and replaced according to your drinks order. When you finish your meal and depart, the entire table will be re-laid, including the tablecloth. At the end of the night, all tables will have been re-laid for service the following day. Then, before the next service starts, your waiting staff will ensure that glasses and silverware are polished, and that serviettes are folded properly. Of course, the food is the main event. You’d expect the chef to be involved in ensuring the fine dining experience. This includes keeping abreast of current food trends, sourcing the best produce, avoiding fads, and listening to guests. Our chef, Neil Lloyd, alters the menu to suit local produce available, and main courses are served with seasonal vegetables. We prepare two fresh soups each day, and you will find that we regularly offer a special main course. You may be aware of the fad for deconstructed dishes. Commonly, these are desserts – cheesecake with all the elements presented separately… or even upside down! Discover why Christopher’s is rated in the top five of more than 260 mid-range, fine-dining restaurants in Torrevieja and the surrounding area. 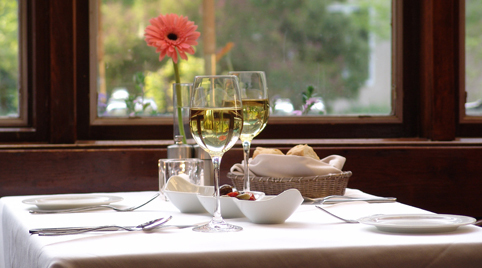 Call Restaurante Christopher on (+34) 600 01 28 24 to reserve your table and avoid disappointment.